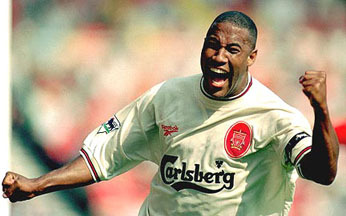 Liverpool career stats for John Barnes - LFChistory - Stats galore for Liverpool FC! Tropical Jamaica seemed another planet away when the family arrived in England on 26 January 1976 after his father had been hired as Jamaica’s military attaché in London. "I had never seen snow before," as John revealed in his autobiography. Within a week he had found a football club, Stowe Boys Club. At home in Kingston Barnes was used to play in the middle or up front, but everybody in the Stowe team wanted to attack and couldn't care less about defensive duties. Barnes spent the next three and a half years with Stowe at centre-half as well as captaining the side. He got an early opportunity to impress Hornets' manager, Graham Taylor, in a youth team game. "Graham saw me control the ball and then send a left-footed volley flying past Orient's goalkeeper. 'That's all I need to see', Graham said to those around him and left." The Vicarage Road club were promoted to the top division at the end of the 1981/82 season. The team had progressed from the fourth division to the first in four years. The 1982/83 season, which was Watford's first in the top-flight, was incredible. On the last day Watford beat Liverpool and Manchester United lost which meant the Hornets captured second place with Barnes as the key player. Striker Maurice Johnston was bought from Partick Thistle and Barnes returned to the left wing the following season. First division sides had caught on to Watford's tactics but they went all the way to Wembley where Everton beat them 2-0 in the FA Cup final. As Watford established themselves in the First Division, Barnes was regularly linked with a move to a higher-profile club. Watford finished 1986/87 in ninth place and at the end of the season Graham Taylor left for Aston Villa. Barnes was also on his way out after featuring in 233 League games, scoring 65 goals. In the summer of 1987. Kenny Dalglish agreed a fee of £900,000 to bring Barnes to Anfield, where he would join forces with the also recently-signed Peter Beardsley and John Aldridge to form one of the club's most attacking and exciting forward lines ever. "Kenny recalled one game when I beat Alan Hansen to score. After that match, Kenny said to Alan: ‘We’ll sign that John Barnes.’ I was completely convinced Kenny bought me to partner John Aldridge upfront. ‘Kenny’, I asked shortly after signing, ‘where will I be playing?’ Without a second’s pause, Kenny replied, ‘Left-wing’. Kenny knew that Peter Beardsley, a clever skilful support striker, would soon be joining. I had thought my left-wing days were over." It only took Barnes nine minutes to create a goal for Aldridge on his Liverpool debut at Arsenal on Highbury on 15 August 1987. Barnes' first real test was his Anfield debut on 12 September against Oxford. Liverpool boss Dalglish was delighted by his performance: "Barnes did what we expected him to do. He made a goal, scored one, and entertained. You remember that." The season was like a fairytale for Liverpool with Barnes as their talisman: "Everything I tried worked: every trick or dribble, feint or pass produced something." Barnes' greatest performance came on 17 October 1987 against League-leaders Queens Park Rangers. He scored what he considers the best goal of his career. Kevin Brock tried to dribble past Barnes in the centre circle when he nicked the ball. Terry Fenwick rushed at him but Barnes pushed the ball to the left of him. "Whenever would-be tacklers came sliding in, I tried to toe the ball past them, ride the challenge and regain balance and the ball on the other side. After I pushed the ball past Fenwick, I landed and brought the ball back with my left foot in one movement. It was difficult to see why I didn’t fall over," Barnes said in his autobiography. Liverpool won the League Championship this season with 90 points, nine more than second-placed Manchester United. Liverpool scored 87 goals of which Barnes scored 15. He got the recognition he deserved for his part in Liverpool's dominance and was voted PFA's and Football Writer's Player of the Year. The double was on the horizon where minnows Wimbledon faced the mighty Liverpool. Wimbledon's 1-0 win was Liverpool's major disappointment in the club's historic season. Liverpool struggled to recapture their form from the unique 1987/88 season but clicked into gear in the second part of the 1988/89 season and put together 15 wins and three draws in 18 League games and reaching the FA Cup final. All this didn't matter however as the Hillsborough disaster claimed 96 lives on 15 April. Despite Hillsborough Liverpool had to finish the season and two exciting finals were on the horizon. The Reds had a three-point lead on Arsenal before the teams met in the last League match of the season on 26 May 1989 at Anfield. Liverpool had a goal difference of 65-26 (+39) against Arsenal's 71-36 (+35). Alan Smith scored in the fifty-second minute and one more goal would mean Arsenal would be champions. Barnes received the ball in the final moments of the game on the right flank and instead of bringing the ball into the corner he tried to go past Kevin Richardson, who took the ball off him. With 91 minutes and 22 seconds of the game played Michael Thomas scored in the most dramatic fashion possible. Some 40 seconds later the game was finished. "In the dressing room, Ronnie Moran said to me, ‘What were you doing? You should have taken the ball down to the corner flag.’ But no one else criticised me. Everyone was too shell-shocked." Liverpool didn't finish this tragic season empty handed. The big two Liverpool teams played each other in the FA Cup final. Barnes finally won his elusive cup winners' medal after final defeats with both Watford and the Reds in 1988. Barnes joined Ian Rush in the forward line in the 1989/90 season as Aldridge had been dropped to the bench and was soon on his way out. Barnes also took over from Aldo as the club's penalty taker. Liverpool were inconsistent throughout the first part of the season but Barnes was very consistent in his goalscoring and had scored 12 goals in just 20 matches. In the second half of the season he scored 16 goals in 25 matches to take his tally to 28. He was top-scorer at Liverpool, two ahead of the prolific Ian Rush. He was second-highest goalscorer in the League two goals behind Gary Lineker. Barnes was voted Player of the Year by the Football Writers Association and joined legends such as Danny Blanchflower, Kenny Dalglish, Stanley Matthews and Tom Finney who also won this award twice in their careers. Liverpool won the Championship in a comprehensive fashion, nine points in front of Aston Villa and 17 points in front of champions Arsenal. The Reds finished the season in style, beating Coventry 6-1 at Highfield Road, Barnes scoring a hat-trick. Liverpool won the first 14 games of the 1990/91 season and in February 1991 Liverpool was in the familiar top position. Liverpool and Everton drew 4-4 in an exciting FA Cup fifth round replay. One day before a League game against Luton, Barnes was on his way to training when he received the astounding news that Dalglish had resigned. Liverpool's title charge petered out and Arsenal won the championship. Barnes still had a good season and scored 18 goals in 45 matches. Graeme Souness was at the helm when the 1991/92 season started. Barnes got injured in the second League match and didn't feature again until January. He played a big part in the team‘s march to the FA Cup final by scoring a hat-trick against Crewe in the third round and in the sixth round his great pass enabled Michael Thomas to score the winning goal against Aston Villa. Barnes also scored one of Liverpool‘s penalties when they beat Portsmouth in a penalty shoot-out in the semi-final replay. Wembley beckoned for Barnes but a few days before the big game he strained his calf while playing volleyball with his teammates in a hotel pool and could only watch from the sidelines as Liverpool conquered Sunderland in the final. In 1992 the 28-year-old was at crossroads in his Liverpool career. The manager who had bought him to the club had left and Barnes realised this could be his last chance to sample the life on the continent. He still harboured dreams about playing for Juventus, Barcelona or Real Madrid. These dreams perished in a warm-up game for the European championship against Finland in Helsinki on 3 June 1992. He ruptured his Achilles tendon in his right leg and was left with a six-inch scar. His injured calf is still an inch and a half shorter than his left calf. He was out until November and this had a detrimental effect on his ability to take players on as he always used his right leg when taking off on a solo run using his left to take the ball past players. A similar injury finished Mark Lawrenson's career and Barnes was forced to change his style of play eventually moving into central midfield. When Barnes was offered a new contract in February 1993 he decided to stay put as he could see it would be a while until he was back to his best. Barnes had been robbed off his electrifying pace and in the 1992/93 and 1993/94 seasons, he was far from the player he used to be. 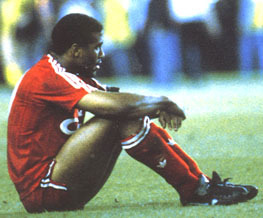 Souness kept faith in Barnes despite criticising him in front of the other players pleading with him to play to the best of his ability. Souness resigned at the end of January 1994 replaced by Roy Evans who created a new role in the team for Barnes. It was plain to see that Barnes' pace had vanished and Evans wanted him to dictate play from midfield and be his coach on the field. Barnes was inspired by this new role as he understood the game better than most. He was left to hold the fort while other players attacked the opposition. Steve McManaman had taken over his role on the wing and flourished with Barnes‘ assistance. Evans handed Barnes the captain‘s armband in 1996 encouraged by his excellent improvement in form. Liverpool had the makings of a title-winning side but the captain felt their discipline let them down when it mattered. Barnes played in his first final in seven years when he faced Bolton in the League Cup in 1995. He created McManaman's first goal in a 2-1 victory. Barnes envisaged lifting the famous FA Cup, but the Reds lost 1-0 to Manchester United in the 1996 final. Barnes had an impressive start to the 1996/97 season and scored one goal in a 3-3 draw. He clearly meant business and was in a much more attacking mood than in previous seasons. His form wasn't enough for the whole team to last the season and capture the title. On 24 April Liverpool played their second semi-final in the European Cup Winners' Cup against Paris St Germain at Anfield. The first leg was lost 3-0. In the previous game Liverpool lost 3-1 at home against Manchester United which ended their challenge for the title. Barnes scored Liverpool's goal with a header which proved to be his last for the club. A few changes were made before the second leg against PSG and Barnes was dropped for the first time in his ten-year career at Liverpool. The Reds did their best with the fans' great support, but just fell short of the final, winning 2-0. Barnes was on the bench for the last three remaining games, only coming as a substitute in the last game of the season against Sheffield Wednesday. Liverpool fell from second to fourth. Paul Ince was bought from Inter Milan in the summer and took over from Barnes as Liverpool's captain. A decade after Barnes arrived at Anfield from Watford in 1987, he was given a free transfer and was signed for a second time by Kenny Dalglish, now manager of Newcastle United. He stayed on Tyneside for two seasons and when he appeared for the Magpies in the 1998 FA Cup final against Arsenal, it was the fifth time he had graced Wembley's showpiece end-of-season finale. Unfortunately, as with Watford in 1984 and Liverpool in 1988 and 1996, he took a runners-up medal home with him. Following Dalglish's departure and Ruud Gullit's arrival Barnes had to seek pastures new at Charlton, who had just been promoted to the top division, to get regular football. He only appeared in 12 League matches and was unable to prevent the south-east London club from being relegated. As Charlton prepared for life back in the First Division, Barnes announced his retirement as a player at the age of 35 nearly twenty years after he had made his debut for Watford. The eloquent and erudite Barnes was always likely to stay in the game in some capacity. However, it was still a bit of a surprise when he was appointed manager of Celtic in 1999 under Dalglish who was Director of Football at Parkhead. It was not a happy time for either man. Although still registered as a player, Barnes never took the field for Celtic in a competitive match. Celtic suffered a humiliating home cup defeat to the minnows of Inverness Caledonian Thistle and Barnes was sacked soon after. Barnes became the latest in a long line of ex-Liverpool players to work in the media covering football, in his case with Channel Five. He returned to his native Caribbean to set up some coaching clinics and was also working in the area as a part-time scout for Sunderland. In September 2008 he was appointed as the manager of the Jamaican national team. Although winners and hosts of the 2008 Caribbean cup, Jamaica failed to qualify for the 2010 World Cup finals in South Africa. A couple of weeks before his contract with the Jamaican Football Federation was due to expire on 30 June 2009 Barnes confirmed that he would be returning to club management as successor to Ronnie Moore at League One club Tranmere Rovers. After a dreadful start to the 2009/10 season, just two victories from the opening eleven matches, it came as little surprise that he was dismissed by Tranmere only a few days after a 5-0 thrashing at Millwall. Jason McAteer, who had been appointed as Barnes' assistant at Prenton Park, left the club at the same time. Barnes was an experienced international when he joined Liverpool with 29 caps to his name. He played the year before in the 1986 World Cup where he was only in a supporting role, but his performance against Argentina in the quarter-finals could have destroyed Diego Maradona's World Cup dream. Six minutes into the second half Maradona scored the infamous "Hand of God" goal past Peter Shilton. Four minutes later Maradona scored a brilliant individual goal. Barnes could only watch in awe from the bench. England was losing 2-0 when Barnes came on as substitute with 16 minutes to go. He didn't take long to make his presence felt and his superb pass from the left flank provided Gary Lineker with a goal. Three minutes from time Barnes made his way down the flank again and passed the ball only for an Argentinian defender somehow to get the ball away from the goal-line. Argentina went on to win the World Cup. Barnes made his international debut against Northern Ireland on 28 May 1983. He had played nine internationals when England faced Brazil at the Maracana stadium on 10 June 1984. Barnes took centre stage a minute before half-time. "For all the superlatives heaped upon that run, I can honestly say that if I had seen someone to pass to I would have done. A pattern developed – look around, no support, keep going, beat another Brazilian, look around, no support, keep going, beat another Brazilian. I didn’t appreciate what an impact my slalom dribble was having. Apparently, one Rio paper described it as ‘the greatest goal ever seen at the Maracana’." This goal proved to be a burden to England prospects as he was expected to repeat this individual brilliance on a regular basis. 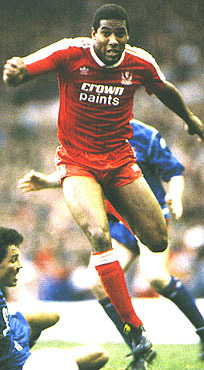 Barnes had been in sensational form for Liverpool leading to the European Championship in Germany in 1988. However, contrary to his club where he was allowed to roam free he was told to stay out on the wing by England coach Bobby Robson where he was starved of the ball. England finished bottom of their group and Barnes was given unbelievable stick in the final match against USSR. Barnes played a big part for England in the 1990 World Cup but an incident in the last sixteen against Belgium was typical for his international career. He scored a legitimate goal which was his first in a World Cup game but the linesman claimed he was offside. He injured his groin in the second half and was on the bench when David Platt's heroics saved England in the 120th minute. Barnes started against Cameroon in the quarter-finals but had to be substituted as he couldn't shake off his groin injury. He didn't feature at all when England lost to West Germany in the semi-finals. One more international tournament finished in disappointing fashion. When Graham Taylor resigned as England's coach it was expected that his international career was over, but in September 1994 Terry Venables put his faith in Barnes. The media wondered if European Championship in 1996 was a realistic option for the experienced campaigner but that didn‘t come to fruition. His seventy-ninth international against Colombia on 6 September 1995 proved to be his last. When John Barnes was at the top of his game there wasn't a more beautiful sight in football.You should never meet you heroes, the saying goes, but don't worry, John Barnes was a magnificent player and furthermore is a fantastic person. It was a momentous occasion when one of the best players in the history of the club, rated by many supporters even as the very best, Billy Liddell, met Liverpool's talisman, John Barnes, in the early 90's, at Anfield. John Martin talks about his favourite players on the left hand side of Liverpool throughout his years supporting the Reds. An article from The Times by Oliver Holt on 14th of January 1995. Match report from The Daily Telegraph on Liverpool - Newcastle on 04.03.1995. Match report from British Soccer Week on Blackburn - Liverpool on 15.10.1994. Match report from British Soccer Week on Southampton - Liverpool on 31.08.1994. Match report from British Soccer Week on Crewe Alexandra - Liverpool on 06.01.1992. Match report from British Soccer Week on Liverpool - Crystal Palace on 28.11.1992. Match report from British Soccer Week on QPR - Liverpool on 23.11.1992. Bob Paisley gives his expert view of Liverpool's newcomer John Barnes. Has there ever been a better judge of a player? Match report on 08.04.1996 from "Press Association"
Match report from 26.08.1995 by Rob King of "Press Association"
John Barnes rates the SAS duo in the Guardian on 31 October 2013. An article by Gregg Bakowski on 22 August 2013 for the Guardian. 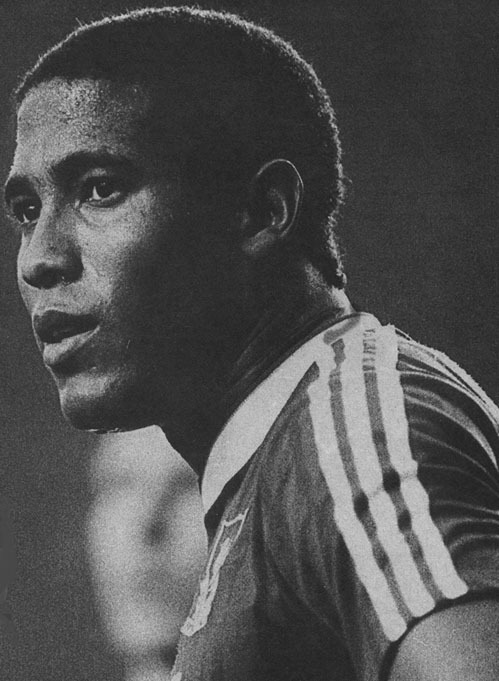 "Players like John Barnes come along just once in a lifetime." "Barnes did what we expected him to do. He made a goal, scored one, and entertained. You remember that." 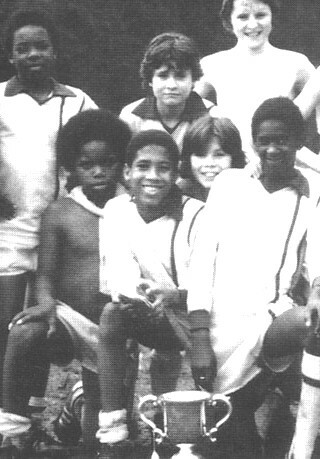 "John Barnes can be the greatest. He was described by the England boss Bobby Robson as the black Best, and I reckon he is right. Barnes has the ability to become the best, the most exciting winger in British Soccer since me. His transfer to Liverpool was the perfect move for a man who was born with stunning talent. The Anfield academy will take that natural ability, harness it with consistency, and produce a truly world-class performer." Barnes on the rampage was one of the most breathtaking sights in the game. Mesmerising ball control was combined with a directness rare in wingers. His balance almost defied belief, with hulking defenders bouncing off those monumental thighs. The football the Barnes-led side played in 1987 and 1988 hit peaks as high as any Liverpool team have reached.